Dr. Red Alinsod completed medical training at Loma Linda University Medical Center in 1990. He served a 12-year Air Force career with 4 active duty years at George and Nellis Air Force Bases. Now in solo private practice, Red has built a large and successful urogynecology, pelvic reconstructive surgery, and aesthetic vaginal surgery following. He is the Director for South Coast Urogynecology and the founder of The Alinsod Institute for Aesthetic Vulvovaginal Surgery. Dr. Alinsod's International teaching program is the first of it's kind to combine both pelvic reconstructive and aesthetic principles together. He has trained doctors and has presented his technique worldwide. He Chairs the American Academy of Cosmetic Gynecology. 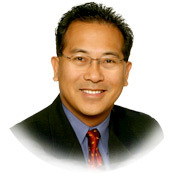 He is the Founder and Chairman of CAVS (Congress on Aesthetic Vulvovaginal Surgery), the oldest and longest running Congress dedicated to Aesthetic Vulvovaginal Surgery and Female Cosmetic Genital Surgery. He is the inventor of the "Barbie Look" labiaplasty.